What's Harry Potter without his wand? Kind of like Frodo without the ring. Batman without his mask. Finn without Jake. The Beatles without John. Fry without Bender. Vader without his mask. Tarantino without blood. Pancakes without syrup. Australia without kangaroos. The earth without the sun. Space without emptiness. Ying without yang. Need we say more? Finish your Harry Potter costume the right way with this wand. While we've found that using Pheonix feather simply isn't cost-efficient, the wand does have a wood texture with a rich wooden color. Whether you're using this for a costume or a prop to keep your bully of a cousin in line, it's good to be matched with the right wand. If you want to make the Wizarding World transformation complete, make sure your Harry Potter costume isn't without a wand. 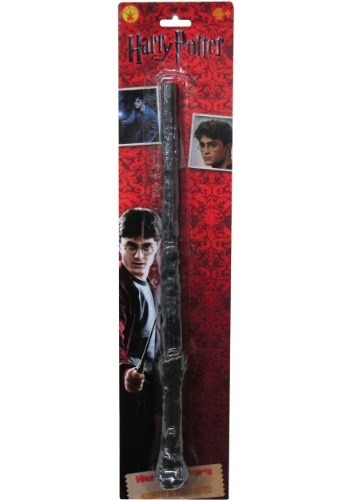 Especially a realistic-looking wand like this one. It's not made of holly wood with a phoenix-feather core, like Harry's, but it could practically summon a griffin all by itself, it's so good. You might find yourself using it in everyday life too. Just don't be surprised when you light up a dark corridor or blow up your aunt—it's that good. We tried to warn you.